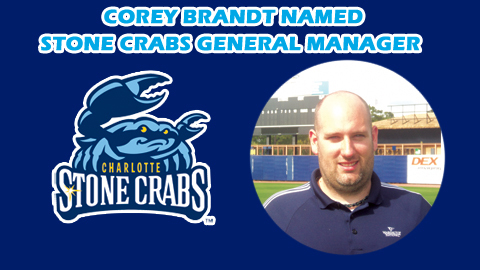 PORT CHARLOTTE - The Charlotte Stone Crabs, Florida State League affiliate of the Tampa Bay Rays, today announced Corey Brandt as General Manager of the Ripken Baseball franchise. Brandt, who is entering his 13th year in professional sports, previously served as the club's Director of Food and Beverage and Stadium Operations. "I am extremely excited about my new role with Charlotte," said Brandt. "I look forward to working with this great community and growing the Ripken brand of baseball here in Southwest Florida." He joined the Stone Crabs in 2012 after serving three years as Vice President of the Tacoma Rainiers (Triple-A, Seattle Mariners), where he oversaw the $30 million renovation of Cheney Stadium. "We are on a constant quest to deliver the best fan experience in baseball," said Jeff Eiseman, Vice President, Sales and Marketing for Ripken Baseball. "Corey's passion, dedication and skills match the opportunity, so we areexcited to have him leading the charge." In between his time in Tacoma, Brandt was the General Manager of Concessions for the NFL's Seattle Seahawks for two years. Prior to that, he was Tacoma's Director of Food and Beverage for six seasons. His first job in baseball came in 2001 with New Haven Ravens as Director of Food and Beverage. A native of Woodbury, CT, Brandt attended the Culinary Institute of America while serving in the United States Coast Guard. He currently resides in North Port, FL, with his wife, Stephanie, 4-year-old daughter, Mattingly, and 2-year-old son, Jack.